1. the process of adding things together: the summation of numbers of small pieces of evidence; a sum total of things added together. 2. the process of summing something up: these will need summation in a single document ; a summary; in Law, an attorney’s closing speech at the conclusion of the giving of evidence. The end of the year is a time when we tend to take stock, to think about what has happened over the past year, to make peace, to give thanks, to look forward. As is always true for me, the holidays are a mixed bag. I am reminded of those favor bags from kids’ birthday parties. Sometimes you get something really cool like a paddleball and sometimes you get those wax lips. Anyway, most of the time, you get a mix. It’s near impossible for me to get through the holidays without feeling a pretty large amount of gratitude for all the blessings in my life: not the least of which are dear ones, family, friends. I have a job. I have a roof over my head. I don’t want for food or clothing. I am not consumed by worry about my basic needs being met. I have amazingly creative, smart, caring people in my life. But the holidays often demand that we be perpetually cheery and grateful, that we shelve our uncertainty. This is not realistic or fair to ourselves. Our uncertainty is always there, and it is pretty friendly with fear and doubt. The holidays also bring with them the end of the year, and for many of us, the end of the year brings an appraisal. It’s as if our lives are our finances and we are working them out in an Excel spreadsheet. Was there enough personal growth? Can we tally a sizable number of accomplishments? How did we fare in love? How many friends and family are we in touch with and how can we measure their love? It is always easier to remember the heartache and trials. Those arise readily. It seems like there can be a process of looking at the year, judging it and deciding if this year merited itself. For some of us, this begins, albeit unconsciously, before we enter the holiday fray. We think about what it is we are going to talk about from our year. What aspect of our lives will make sense to our friends and family? How do we make our lives measurable? I find this process exhausting. Because the heart of the heart of my year doesn’t happen in these large moves, defeats or accomplishments but rather in moments of profundity and understanding and grief and joy. A dear friend of mine told me last night that she is making a “Good Things Jar” for the new year. Next to a large mason jar, she will place scraps of different colored paper, ready and waiting to mark the good things that happen in her life. The small and the big ones. She will fill the jar with these things and next year, on New Year’s Eve, she will read them: remembering her year and all the good that was present in it. I love this idea. I love the ways we can remind ourselves of all that is good. Because we need reminding. In The Buddha’s Brain, neuropsychologist Rick Hanson writes about how the brain is like velcro for negative experiences and teflon for positive ones. We are hardwired that way, because for our ancient ancestors, survival depended upon it. If they didn’t remember what could kill them, they died. The way it plays out for us nowadays is that we ruminate and fixate and mull over negative experiences, not just the ones that are going to kill us but the ones that caused us pain. What once protected us from dying can now prevent us from being fully alive. There is a term in Buddhism called “mudita.” It means joy. However, it goes beyond that. Mudita is about experiencing genuine joy for others. And while it seems like this comes from a selfless place, it doesn’t. Mudita comes from a place of recognizing our oneness with others. If we are having a hard time but are able to partake in another’s joy, if we can recognize how we are connected to this other person, we can be joyful as well. Still, joy is something we have to come into on our own. I have known people who will ask how I am and, when I answer honestly about having a challenging day or a hard time, will say things like: “Well, you have so much be grateful for” or “Think about all your blessings” or “Look at how many people are worse off.” And that doesn’t feel honoring. It feels like they are made uncomfortable by my grief or fear and are trying to excise it. Perhaps because my grief or fear reminds them of their own. But we cannot be coaxed into joy. We must find it ourselves. Help positive events become positive experience: Pay extra attention to the good things in the world and in yourself. For example, notice things that go well, or people who treat you kindly, or when you succeed at something. As we know, it is ignorance, fundamentally, that leads to suffering – and not seeing the good that is actually present is a kind of ignorance. As a mindfulness practice, focus on the sensations and the feelings in your positive experiences since they are the pathway to emotional memory. Deliberately create positive experiences for yourself. Examples include acts of generosity, evoking compassion, or recalling a time when you were happy. Savor the experience as a kind of concentration practice; keep your attention on it for many seconds while letting it fill your body and mind. Sense that the experience is soaking into you, registering deeply in emotional memory. You could imagine that it’s sinking into your chest and back and brainstem, or imagine a treasure chest in your heart. Often, we will make a list of new year’s resolutions, most of which point to areas in which we feel inadequate. They point to our own sense of lack. 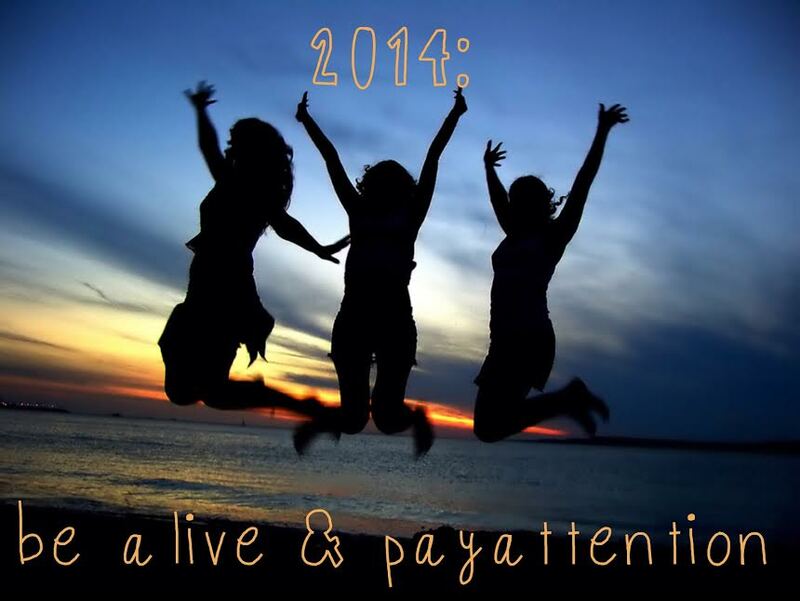 But maybe resolutions don’t need to be about dramatic change in behavior or in circumstance. Perhaps the simplest and best new year’s resolution is to resolve to pay attention. To notice all the opportunities for joy we already have. Then our intentions for the year aren’t built on a belief in our deficiency but on a recognition of our own abundance. Life is not a score tally for a board game. I find that the greatest pain and suffering for others and myself comes when we try to keep score with our lives. There is no way to add and subtract and compare two different lives. To do so is to pretend that we know the intimacies of someone else’s path. To do so is to pretend we know what is going to happen in our future. We simply have to honor where we are and honor that means we don’t know quite a bit. I read an old Charlie Brown cartoon today where Charlie tells Lucy: “Life isn’t like a textbook. The answers aren’t at the back of the book.” What if instead of this becoming a source of frustration it became an opportunity for wonder? Look at how much I don’t know! Look at how much I have the opportunity to learn! I like watching lawyer shows where the attorneys deliver their summations in court. So often they are clear and wrapped up tightly, like the bow on a Christmas present. The decision seems so simple and easy. Life is not like that. We deliver our summation and then a few days or weeks or months later, we deliver it again. At the end of the year, we look and listen and sum our lives and then we do the same thing a year later. But the words are always changing, the verdict is malleable. As we approach the new year, perhaps we could remember all that we have learned this past year that has prepared us for the new one. Perhaps we could remember that this new year brings not one but countless opportunities to begin again. We can choose to remember in the myriad of experiences we have that they all add up to being truly alive.